Writing under a man’s name, Josephine Breaux is the finest reporter at Washington’s Morning Clarion. Using her wit and charm, she never fails to get the scoop on the latest Union and Confederate activities. But when a rival paper reveals her true identity, accusations of treason fly. Despite her claims of loyalty to the Union, she is arrested as a spy and traitor. To Josephine’s surprise, she’s whisked away to the White House, where she learns that President Lincoln himself wishes to use her cunning and skill for a secret mission in New Orleans that could hasten the end of the war. For Josephine, though, this mission threatens to open old wounds and expose dangerous secrets. In the middle of the most violent conflict the country has ever seen, can one woman overcome the treacherous secrets of her past in order to secure her nation’s future? Mishker (Grade: A) I love reading about women in the Civil War. 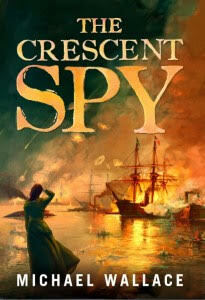 The Crescent Spy offered an exciting account of another brave woman who gave her all during the war. Josephine’s character is very intriguing with her past as interesting as her present. Josephine is intelligent, fast-thinking, brave and compassionate. I loved seeing her perspective on the battles and her news stories. Josephine acts truly selflessly in all of her actions throughout the war.